Madonna has stopped ramblers walking across most of her estate. 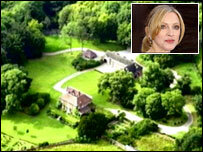 Ramblers may not be welcome on parts of pop star Madonna's £9 million estate, but a group of Quakers say they are. A Quaker burial ground, visited by local members for centuries, lies amid the 1,132-acre Ashcombe Estate, on the Wiltshire/Dorset border. Madonna partly won a challenge to rules allowing ramblers on to her estate, but the Quakers say she has not tried to block them. Quaker Audrey Acton said: "We have had no obstruction from Madonna." The 60-strong Shaftesbury Preparative Meeting scatters ashes of the dead, during funerals, at the historic site. It also stages a pilgrimage and worship gathering there every 10 years. The next one is scheduled for 2010. In 2000, there were around 200 Quakers, many of whom had come from other meetings in the area. Madonna is said to be "OK with that", according to a member of the group. The burial site on the land, which belongs to Madonna and her film director husband Guy Ritchie, was established in 1663 when the then-owner of the estate, William Fry, became a Quaker. At the time, Quakers were being persecuted and had no other safe place to lay their dead to rest. Ms Acton, a member of the Quaker group in Shaftesbury, said: "We are not interested in Madonna's estate as such, we are only interested in the burial ground." In June, the Ritchies won their bid to prevent ramblers from walking across most of their estate. They claimed at a public inquiry in May that their human rights would be infringed. The Planning Inspectorate ruling means walkers are not able to go within sight of the couple's home, sitting in the estate's grounds. A spokesman for the pop star said he was unable to comment on any land issues.